GYPSY QUEEN was formed in 1997. They has performed across Asia more than 120 times from 2001. They have drawn 5,000 audience to their solo concert in China, and more than 10,000 audience to their appearance at "Wat Phou festival", the big religious festival in Laos. They have collaborated with a Chinese popular artist, Yip Sai Wing(ex-BEYOND), and released "Paradise in your soul(contained in their 2nd album, "SILK")". 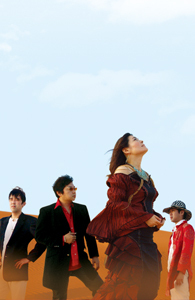 They have also collaborated with the Vietnamese big national stars. For example, they released CD with My Linh, Lam Truong and Hien Thuc, and they also appeared in Ho Quynh Huong's s concert tour in Vietnam. Their activity is global and cross-border. They make effort to play the role of gateway to Japan for introducing other Asian countries' culture, like organizing Vietnam Festival in Japan. 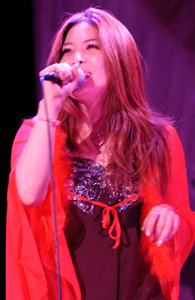 She can sing in 10 Asian languages like Japanese, Chinese or Vietnamese, and she is good at communicating with audiences in the local language where they visit. She is the cosmetic freak and knows well about the arcane cosmetic information in Asia. 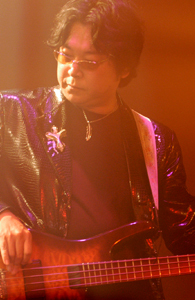 Aki The leader and producer of GYPSY QUEEN. He writes the lyrics and music for the band. His tour report includes many rare information of Asian countries, and it's popular among not only music fans but also tourists in Asia. 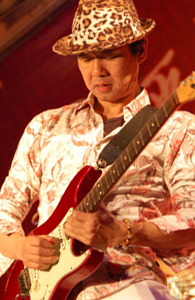 His tricky performance and guitar technique always liven up the concert. He really loves to drink local beer in Asian countries. His trademark is the animal-printed cowboy hat. 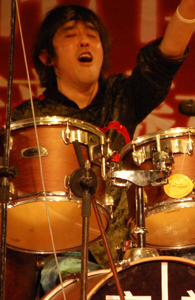 His dynamic drum performance always wow audiences in Asia countries. He is a dedicated drummer. Copyright (C) ONE ASIA All Rights Reserved.